Virginia continues to enjoy a strong and steady employment rate that rides slightly above the national average. Defense and security spending, as well as other factors, have helped the Commonwealth rank eighth in the nation in employment growth. Employment growth is an indicator of expansion in the economy that represents an increase in the economic opportunities available to the citizens of a region or the state. To a greater extent than most other economic indicators, it provides timely and comprehensive data. Employment growth is generally tracked as a percentage change from a year ago. The pace of employment growth in Virginia has mirrored that of the nation over much of the last decade, with employment in the Commonwealth growing an average 1.8 percent compared with 1.4 percent in the nation. As in the rest of the nation, employment dropped during the recession that started in March and ended in November 2001. The 2.2 percent decline in employment growth in Virginia during and after the recession was about the same as the 2.1 percent drop in growth in the nation. However, in a sign of strength, employment in the Commonwealth hit pre-recession levels by March 2004, much sooner than in the nation, where employment did not reach pre-recession levels until January 2005. Virginia's relatively strong performance is partially due to increased spending on national defense and security. From 2003 to 2004, Virginia's employment growth rate was 2.5 percent, which was lower than Nevada (5.64 percent), the fastest growing state in the nation, but higher than North Carolina (1.79 percent), Maryland (1.49 percent) and Tennessee (2.0 percent). The national employment growth was 1.55 percent. 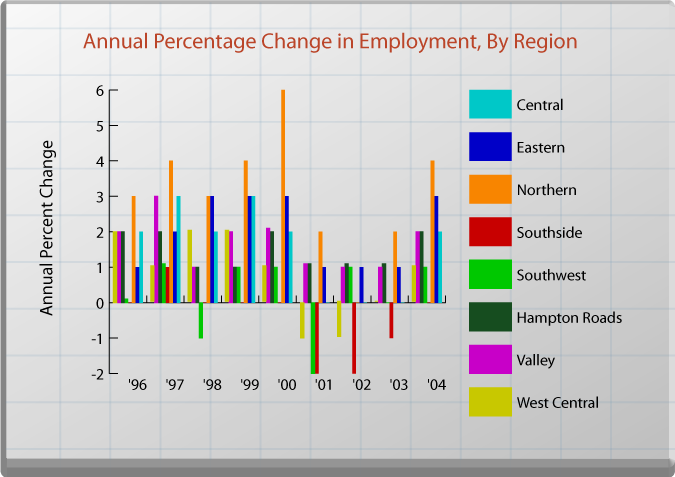 Note: Regional employment growth values close to 0% do not appear on the chart. With regard to regional employment growth, data through the third quarter of 2004 indicates that the Northern Region (4.0 percent) has been the fastest growing region in the state over the last year. The Eastern Region also showed strong employment growth over the same period (2.5 percent), while the Central and Valley Regions registered 2.2 percent and 2.0 percent respectively. In contrast, Southside (-0.4 percent) and Southwest (1.1 percent) exhibited the weakest employment growth over the last year. The three most important factors influencing employment growth are national business cycles (expansions and contractions in the economy), the mix of industries, and the relative attractiveness (competitive advantages) of the region. Although underlying business cycle trends may be similar, its mix of industries affects the magnitude of the variation in a state or region's employment growth. 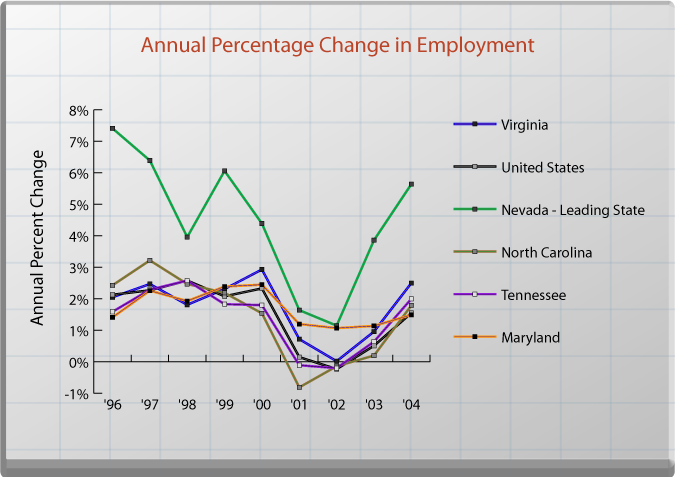 For example, through most of the last 10 years, employment growth in Virginia and the nation has been significantly influenced by two trends: reduction in manufacturing employment due to global competition and labor-saving technology enhancements, and strong employment gains in the professional and business services industry. As a result, states and regions with high proportions of employment in manufacturing experienced downward pressure on employment growth, while those with a higher percentage of professional and business services experienced upward pressure on growth. Finally, states and regions with competitive advantages relative to other regions are more likely to maintain their existing businesses and experience growth. Because business, and particularly small business, is the driving force behind employment growth, an attractive business climate is more conducive to higher levels of employment growth. The state's primary role in employment growth is to provide the infrastructure, in terms of education and training, workforce development, transportation, and other public goods, that reduces the transaction costs associated with economic activity. Adequate infrastructure enables private business, the engine of employment growth, to better respond to emerging economic opportunities. In addition, the state can assist in employment growth by fostering a competitive business climate. Industry Clusters: Virginia's Economic Development Partnership lists resource advantages for industry clusters. Virginia Enterprise Zones: The new Enterprise Zone Grant Program makes available two new grants for qualified business firms and zone investors: wage-based job creation grants and real property investment grants.